NY Fishing Charters for first timers, pros, and families! Capt Andy has over 30 years of regional fishing experience, and is an accomplished writer, seminar speaker, tournament angler and expert on both inshore and offshore fishing. He has been a licensed NY fishing charter captain for over 20 years. Capt Andy LoCascio is the host of the hit fishing TV show Northeast Angling. All of the episodes, features, and instructional videos are available FREE on the Northeast Angling YouTube channel. You can also follow all the news and features on the Northeast Angling Facebook page. He is the founder and captain of Team Triton/Mercury the 2008 FLW Striper Series champions. Capt Andy has also been featured in numerous magazine articles and on other national TV shows. Click to learn more about Captain Andy LoCascio. Guests (of any age) need no prior fishing or boating experience, Capt Andy will provide all the instruction you need. 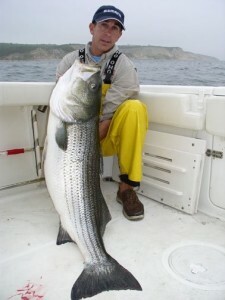 He is also available for personalized instruction for anglers learning to fish the Long Island waters on their own boats. Capt Andy is also comfortable working with kids and families and is the perfect choice for your child’s first charter fishing experience! Always be sure to let him know the ages of any children in the group to ensure the proper safety equipment is aboard and the trip plan is appropriate. Walk the dog deep to fetch more fish!